In the past years, GN Solids Control has received many inquiries on the oily sludge treating systems. 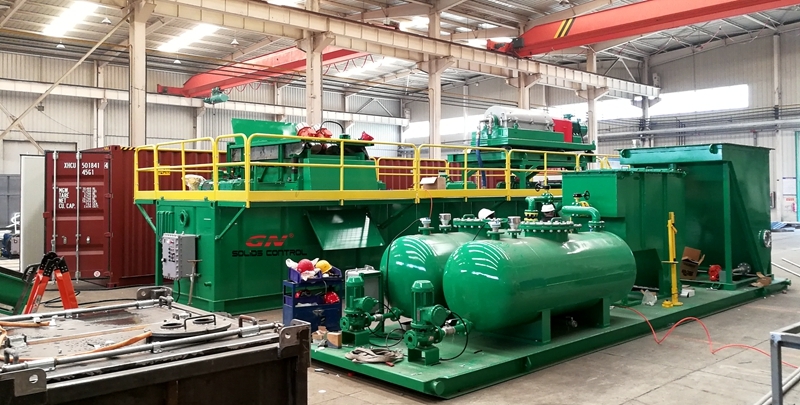 GN Solids has been providing various solids control and waste management for the oil and gas drilling cuttings treating, while as more and more companies pay attention to the environment protection, there are increasing demands on the oily sludge treating systems. As most of the cuttings have a large viscosity, one premixing an heating tank is pretty necessary. All the sludge will be heated in order to run smoothly. Shaker is used as the first step separation equipment. All the large solids will be separated out by the shaker first. In order to keep the large solids fall off to the tank bottom, there are 2 mud agitators are on the shaker tanks. GN centrifuge is the second phase treating equipment, finer solids will be treated from the slurry that treated by shaker. GN 3-phase separation system is used to separate out the finer solids, while the oil and water are further treated by oil and gas separator. Two separated oil tank and water tank will be used to collect oil and water. GN Chemical Dosing Unit is used to mixing the chemicals before feeding into decanter centrifuge. Flocculent is used to gather finer solids, so decanter centrifuge can separate out those finer solids. Level meters are fixed in the mud tanks in order to keep the mud from leaking. Hot sensors are also used to keep the screw pumps from rotating when there is no mud inside.